I wanted to like it so bad but it was just gross to me. The avocado gave it a weird aftertaste. Hmmm, I loved it. Had a light texture more like parfait. Already a repeat buy for me. Could it be a dip for chips possibly? My mind thinks it could work more like onion dip than just a yogurt! I think it would be good for dips/spread. Swap out for mayo on sandwiches. Again, an interesting thought, Alek. I'd still say it's too sweet and citrusy for that, but it's worth a try I guess. It could work for like chicken salad. Unique twist. Or turkey sandwiches. Agree. Just not anything like it seemed it should have been. A giant miss for TJ. This may have been one of the most vile things I've put in my mouth... and I've experienced the stinkiest of cheeses, worst of wines and even recall trying dog food as a young kid (I think I spat that out). It seemed almost offensive that it was even made... that said, my coworker, who usually doesn't like avocados, enjoyed it. I love avocados and was appalled. If it wasn't so awful, I'd be willing to try it on a taco-- probably chicken or fish, where both avocado and citrus are welcome-- but don't think I could even attempt that. This had so much potential- good on paper but in real life....not so much. For all the reasons you named. I'm a big fan if savory yogurt, and on the hot summer nights i make a lot of savory yogurt bowls with plain greek yogurt, chopped cucumbers, chopped kalamata olives, basil or dill, salt and pepper, and whatever nuts or seeds i have around. Often avocado ends up in there too. I would love savory 2% yogurt from TJs, but this isn't even close. You need to try some traditional Greek Yogurt, STAT! 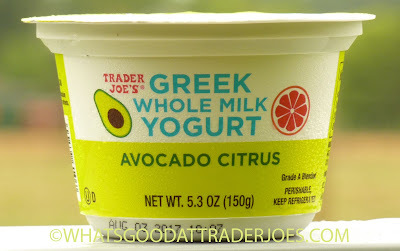 The fact that you keep describing the flavors that make Greek yogurt taste like Greek yogurt as "citrusy" and "sour" leads me to believe you've not had the real stuff. IN FACT, most "Greek yogurt" sold in the USA isn't made like Greek yogurt at all! The usual process involves taking whole-fat yogurt (because it wouldn't work otherwise) and straining out the whey, making an extra thick concentrated and creamy yogurt bordering on cheese in its makeup. American Greek yogurt? Usually just American yogurt with a thickening agent added. 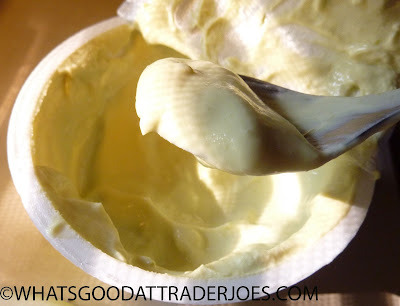 Try Fage's full fat version, it's one of the closest supermarket brands.